Experimental Archaeology is a discipline which uses contextual experiments to aid our interpretation of archaeological data. Our research projects work mostly with materials and technologies that we can harvest and manufacture ourselves; for example, natural fibres for cordage or containers, stone tools, food procurement and processing. Our experiments are generally field-based: we believe that working in this way provides us with insights that a laboratory environment does not. However, where appropriate we include scientific equipment to supplement our work and to act as experimental controls. Dr Peter Groom and Dr Tine Schenck have authored a number of research papers in the field of experimental archaeology. A list of these are available at the bottom of this page. We run activities and workshops to discover how our Mesolithic ancestors procured and processed a range of materials,and to learn and appreciate the skills that they possessed. In July 2018 the Mesolithic Resource Group attended the Kierikki Stone Age Centre, Pahkalantie, Finland. 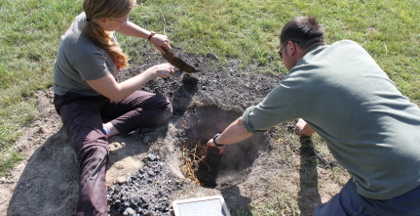 It provided us with the opportunity to practice experimental archaeology in a 'Stone Age' landscape enhanced by the many reconstructions at Kierikki. One of the projects undertaken was the actualistic reconstruction of a section of the Neolithic wooden fish weir discovered in 1995 at the nearby site of Purkajasuo. The complete article is available at EXARC journal. In July 2018 a group from the UK participating in the Placements in Environmental, Archaeological and Traditional Skills (PEATS) Erasmus + Work Placement, attended Kierikki Stone Age Centre, Pahkalantie, Finland. The experimental programme was coordinated by Dr. Peter Groom of the MRG. In order to involve as many students as possible, this week-long project built an elk skin-on-frame canoe. The complete article is available at EXARC journal. 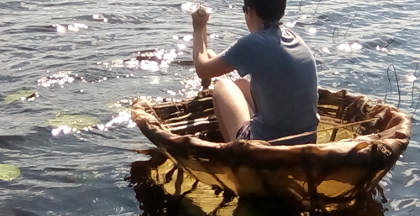 In order to provide an alternative form of boat it was decided that a week-long project would be to build a skin-on-frame coracle. The complete article is available at EXARC journal. In partnership with the University of Edinburgh, this research sought how stone and bone beads might have been made at this famous Mesolithic-Neolithic transition site. 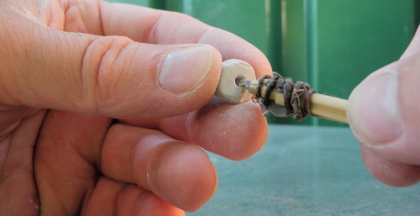 Using tiny flint drills and reed stems Peter Groom was able to replicate the artefacts. Published in the Bulletin of Primitive Technology (see below). The starting point for the experiments were the finds of ancient birch bark tar, from Königsaue in Germany, and tooth marks on several Scandinavian Mesolithic specimens. 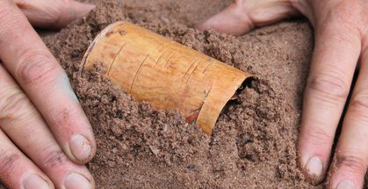 A variety of structures were created to try and replicate the production of birch bark tar without pottery. None of the experiments resulted in useable tar, however, two showed evidence of the initial stages of tar production. The experiments were undertaken in collaboration with public archaeologist Grethe Moéll Pedersen, and Sagnlandet, Lejre, Denmark, provided us with the facilities and necessary funding. The project is registered at Sagnlandet under reference no J.W. 12/09. The online publication of the experiments can be found in Archaeological and Anthropological Sciences 2015 vol 7 issue 1 (available online). 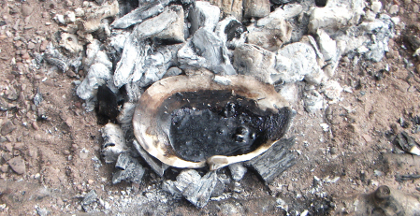 Building on the work from 2009, in 2013 we successfully produced birch bark tar without pottery using only sand, birch bark, and fire. These experiments focussed on the use of raised structures, which had showed promise in our previous experiments. Additionally, we were attempting to discover how Neanderthals might have made birch bark tar. The online publication of the experiments can be found in Archaeological and Anthropological Sciences 2018 vol 10 issue 1 (available online). In the project Dimensions of Functionality in Prehistoric Societies, Tine worked with Christian Horn at the University of Gothenburg, to haft, test, and analyse usewear on a TRB halberd. The pilot project video is available online. This research involved the creation of a range of fishing gear that might have been used by Mesolithic coastal dwellers associated with some of the west coast middens of Scotland. Using middens as the evidence, gear such as fishing lines and portable traps were created incorporating locally found materials. The gear was then tested in a range of marine situations. The online publication of the experiments can be found in The Journal of Island and Coastal Archaeology 2018 vol 13 issue 3 (available online). Dr Peter Groom and Dr Tine Schenck have authored a number of research papers in the field of experimental archaeology. Groom, P., McDermott, I., & Kirby, E. (2019). 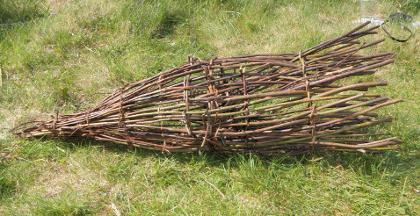 The Construction of a Skin-on-Frame Coracle at Kierikki Stone Age Centre. (available online). Groom, P., Sweeney, P., & Findlay, J. (2019). 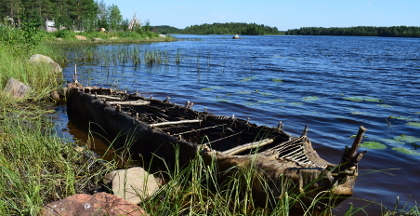 The Construction of a Skin-on-Frame Canoe at Kierikki Stone Age Centre, Finland, as a Medium for Group Training in Ancient Skills and Experiential Learning. (available online). Groom, P., Pickard, C., & Bonsall, C. (2019). Early Holocene Sea Fishing in Western Scotland: An Experimental Study. Journal of Island & Coastal Archaeology. Vol 13(3). (available online). Groom, P., Kirby, E., & Findlay, J. (2018). 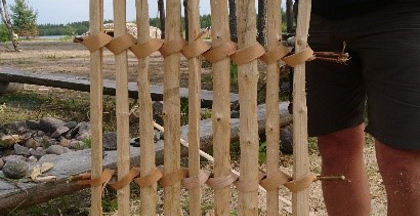 The Construction of a Replica Section of the Middle Subneolithic Purkajasuo Lath Screen Fish Weir at Kierikki Stone Age Centre, Finland. (available online). Schenck, T. & Groom, P. (2018). The aceramic production of Betula pubescens (downy birch) bark tar using simple raised structures. A viable Neanderthal technique? Journal of Archaeological and Anthropological Sciences. Vol 10(1). (available online). Groom, P. (2016). The Hunter, the Dog Men and the House by the Shore. Amazon books. (order online). Groom, P., Schenck, T., & Pedersen G. (2015). Experimental explorations into the aceramic dry distillation of Betula pubescens (downy birch) bark tar. Archaeological and Anthropological Sciences. Vol 7(1). (available online). Groom, P. (2013). Experiments with a finger drill. Bulletin of Primitive Technology 46, 10-16. Bonsall, C., Pickard, C., & Groom, P. (2013). Boats and Pioneer Settlement: The Scottish Dimension, Norwegian Archaeological Review, 46/1. Schenck, T. (2011). Experimenting with the unknown. In Experimental archaeology: between enlightenment and experience. Edited by B Petersson, and L E Narmo, Acta Archaeologica Lundensia, no.62. (available online). Groom, P. (2010). Yarns in Ancient Times. Yarnmaker. Vol 2:3. Schenck, T. (2010). Why were they pots? : an experimental perspective on the introduction of ceramics in Early Neolithic South Norway. Lambert Academic Press. (available online). Groom, P. (2009). 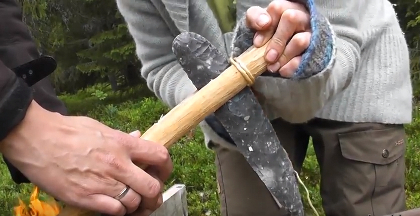 Experimental archaeology: How can it help us to understand our links with nature and the past? Nicolay 107:45-50. Schenck, T. (2009). Can we involve the public in experimental research? EXAR Bilanz. For enquiries about the courses we offer, or to book us for an educational event, please email peter@mesolithic.org.uk. © Mesolithic Resource Group. All rights reserved.